If you want to do something controversial, it's easy. Just create a series of themed sculptures and place dozens of them around the city. The last one that I recall was the Cow Parade. "To mark the July 15 All-Star game at Yankee Stadium, 42 baseball-themed Statues of Liberty are on display in New York. 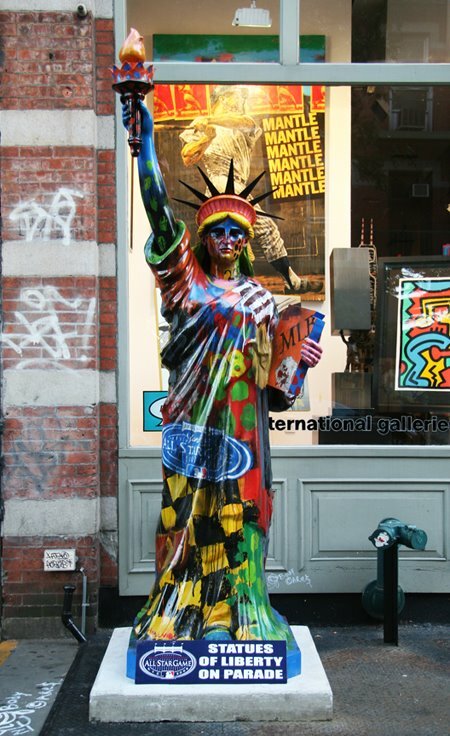 The Stephen Holland statue, Pop International Galleries, 473 West Broadway, at Houston Street, in SoHo area of Manhattan, celebrates the artist commissioned to paint them all. Apparently, he was so intent on having 42 to honor Jackie Robinson, he made one for himself." Each statue is uniquely designed with bold graphics and colors featuring each of the 30 Major League Baseball clubs, the Brooklyn Dodgers, the New York Giants, the American League, the National League, four All-Star statues and statues commemorating the final season of Yankee Stadium and Shea Stadium (the game is the final season of Yankee Stadium and Shea Stadium.) The 8.5 foot tall, 250 pound statues are made of resin and rest on a 530-pound cement base.